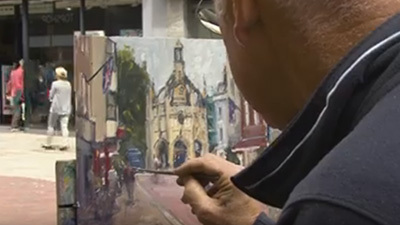 Richard Pikesley's new film, Creating Light in Oil, provides a detailed view of how to build a painting from a variety of studies. 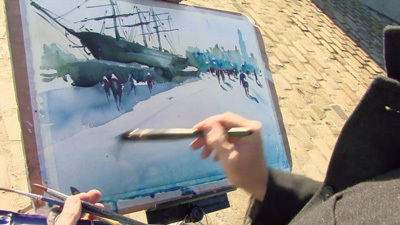 He works on four main paintings throughout the film, both in his studio, and on location, the first destination being the wonderful beach at Charmouth. He works on a sweeping view looking towards Golden Cap, which is not looking very golden on this occasion, under a heavy sky. He works fluidly on this painting, with a few figures to indicate scale, and leaves it as a finished piece in this one sitting. Pikesley then moves to The Cobb at Lyme Regis. He completed three small paintings here the previous year and these form the starting point for a new painting. The curved harbour offers a constantly changing scene as people and dogs walk along it. He completes a further study to complement his originals, and then walks further around harbour wall to paint a view looking through the rigging of the anchored boats towards the town. 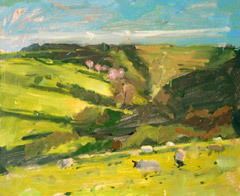 ln contrast, he then moves inland, to paint the stunning scenery of Eggardon Hill, the site of an iron age hill fort. lt creates a dramatic natural bowl, with fantastic deep shadows cast by the early morning sunshine, creating an abstract pattern of diagonals. Not aiming for detail, he instead applies colour to the large shapes in front of him maintaining the strength of the image. Back in Lyme he returns to his four earlier small paintings, and builds on this reference material with pencil and colour studies. 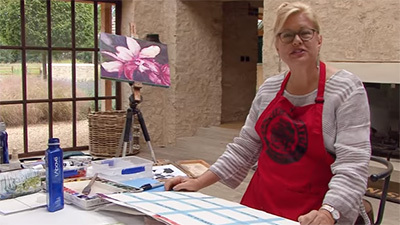 Armed with this varied collection of images, he is able to decide on the composition for a larger painting and transfers his chosen image to a canvas using a grid, back in his studio. 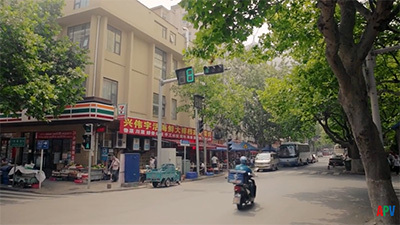 As he builds the painting, he has to constantly reassess the balance, since he is aware that by creating the composition from a number of images, it could end up lacking unity. He also works on his painting of the boats, increasing the vibrancy of the colours and adding detail. Both paintings are taken back out on location to finalise details. 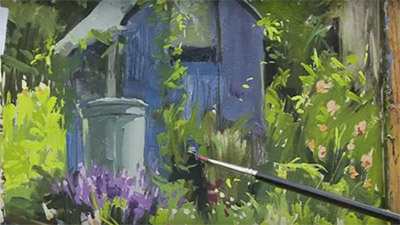 This two-hour film offers excellent guidance in how to develop and refine a painting, demonstrating the value of making detailed and loose studies, and how to use them to construct a strong final image. 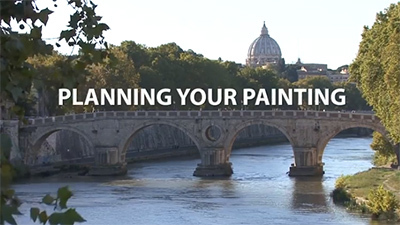 Many artists believe that their liveliest and most successful work is when they paint en plein air, with its opportunities to capture a direct response to the light and mood of the landscape. 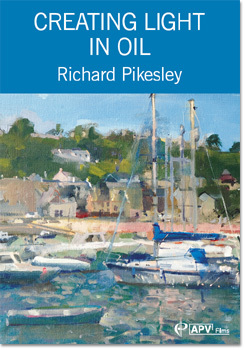 In Creating Light in Oil Richard Pikesley paints at some of his favourite locations along the Dorset coast and at Eggardon Hill, showing how to build up a wealth of reference material that will be invaluable later for studio work. On site, Richard makes drawings, paints on small primed boards and sometimes starts on large canvases. His working process, the way he gets to know a subject and amasses useful reference information, is fascinating to watch. 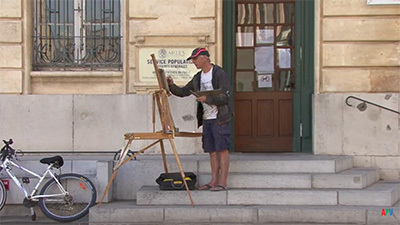 It is a masterclass in the best plein-air practice. And as his paintings prove, a genuine knowledge and experience of the subject will always enrich and inform the results. It's always fascinating to watch somebody paint and none more so than Richard Pikesley, in my view a most sensitive artist to the landscape. A very good video, two hours of oil painting from a top craftsman with interesting points for any artist to note. Did he notice Eddie Jordan whilst painting the Cobb or the lame sheep on Egardon? An excellent video which gives a real insight into the artist`s thought process as well as technique. I have learned so much from this, especially as regards colour-mixing. While I love all aspects of his work, I especially admire his harmonious, soft palette; something I will take on board in my own work. Richard Pikesley is, in my view, one of those rare artists who combine exceptional skill with the ability to communicate effectively on your level. A most likeable persona! Go on! Buy it, you won`t be disappointed!